New York is the backdrop of many films. 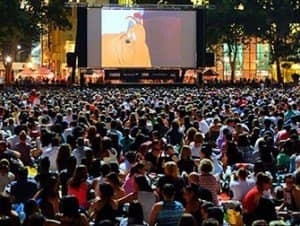 Every summer you can enjoy watching free films in the open air at Bryant Park during the Bryant Park Movie Nights. Every Monday night from June up until August a film is shown on the lawn. You can find a place to sit down from 17:00 onwards and the film starts at sunset. This is around nine o’clock. The film lasts until around 23:30. 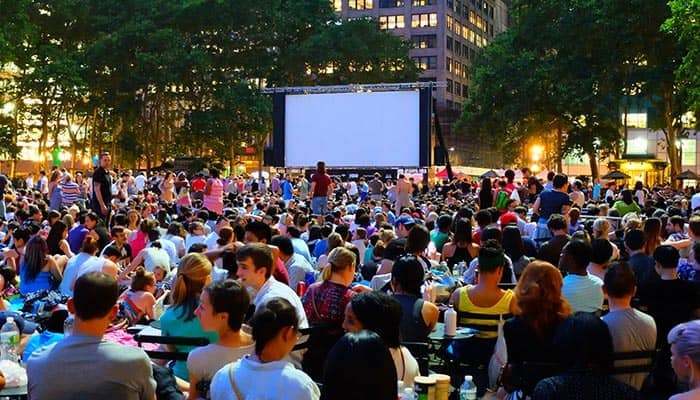 Because of the popularity of the Bryant Park Movie Nights, it’s advised to come on time to find a place to sit. Many locals bring a blanket and some snacks to enjoy a picnic in the park beforehand. Eric’s Tip: This is a great thing to do for a fun summer night in New York. You should come on time as the film festival is very popular. The most people come between 18:00 and 19:00. To make most of your night I suggest to take food and drinks and of course a blanket to sit on. The film festival is also the perfect opportunity to talk to the locals, who are always keen for a chat. It can get very cold during the Summer nights in New York so be prepared and bring a jacket or jumper. You can also make use of the famous toilets in Bryant Park – full of fresh flowers!